We decided to get crafty—or as "crafty" as some of us can get—for this year's Last-Minute Gift Guide. We tested out some of the DIY kits and looked at videos, blog posts, and Pinterest to guide us down our path to making magical gifts for the people in our lives. 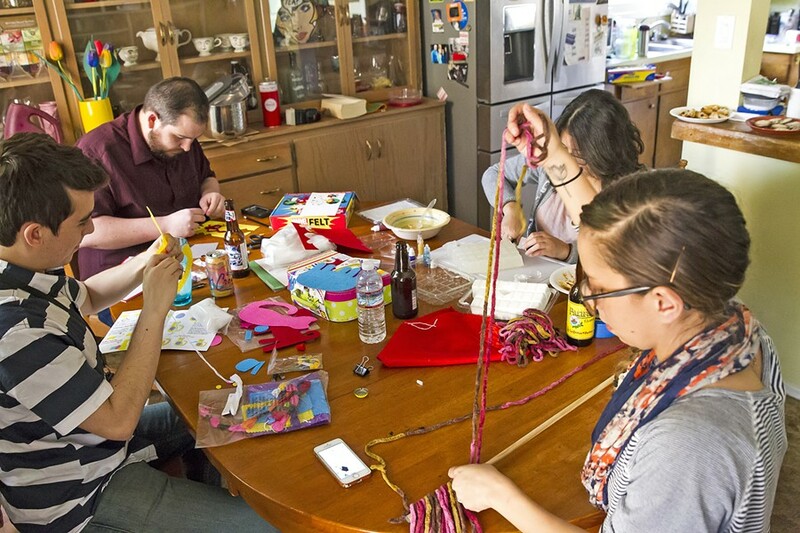 CRAFT DAY Sewing, soap making, and macramé are do-it-yourself gifts anyone can craft for their family and friends. After all, it can be hard to pick out the perfect gift for someone. Instead, putting some thought and time into a project can infuse a gift with the love it needs to push it past the "it's the thought that counts" mantra (or not, depending on how the craft turns out). We crashed Glen Starkey's house with materials in hand to see if we could make some holiday magic out of our selected projects. Most of the projects were done in a couple of hours or less. Others ... took a little longer, but that could have been the fault of the maker—not the project. Perusing the aisles of either Beverly's or Michaels is a good place to start, but here are some testimonials to give you the push you need to DIY that last-minute present. INSTRUCTIONS FIRST Definitely read the manual before diving into sewing your first Marvel Universe felt character. 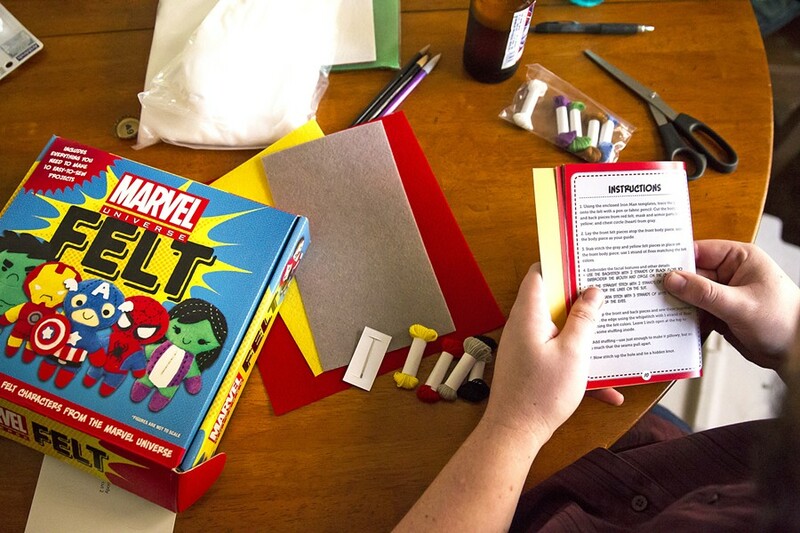 I've never been a big DIY guy when it comes to Christmas gifts, but the inner comic book geek in me couldn't help but get a little excited when I picked up the Marvel Universe Felt Crafting Kit off the shelf at Beverly's. The kit allows anyone to create cute little felt characters based on Marvel's wildly popular franchises, including well-known superheroes like Captain America, Hulk, and Iron Man as well as some lesser-known characters like She-Hulk and Doctor Strange. The kit comes with everything you need to make a total of 10 different little characters and a handy step-by-step "how to" booklet. For my first attempt, I picked Iron Man, who was one of the "easier" characters to make according to the booklet. I have absolutely no experience sewing, but was promised easy-to-follow directions for everything from cutting out the felt shapes to how to properly knot and stitch the "sewing floss" (don't call it thread!). While it was generally helpful, I was a pretty hopeless case even with the booklet's instructions. It didn't take me long to ditch the suggested stiches and knots and "improvise" my own, a strategy that met with mixed results. Perhaps I should ask Santa for a little patience this year? In the end, the directions were good enough for me to complete my tiny Iron Man, but my lack of skill was evident in the finished product. Thankfully, there are nine more characters I can craft to try and better my skills. In the meantime, I hope whomever I end up giving this to truly understands the old "it's the thought that counts." I know of a certain small dog currently residing in my apartment who loves playing with stuffed creatures and isn't picky about the quality of my backstitching and roll knots. When it comes to the holiday season, gift giving is my specialty, but I like to start my holiday shopping kind of early—sometimes as early as the last week of October. So the concept of last-minute is pretty foreign for me. When I think of crafting, what comes to mind is homemade and local ingredients. So I thought about a soap bar, something practical that I could put my creative twist on. Although I didn't make the soap from scratch or use local ingredients (I went to Michaels for supplies), I did make this by myself. That counts right? GOAT SOAP A block of goat's milk glycerine is turned into bars of soap, starting with the microwave and a bowl. 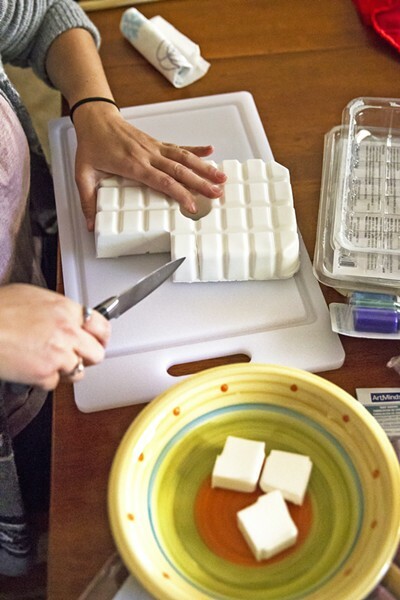 Making the soap is pretty simple if you bypass creating the soap from scratch. I started with the goat's milk glycerine soap. I cut three squares off the block, put them in a microwavable bowl, and put it in the microwave for a minute. Once it melted, I stirred in some droplets of color, poured it into the mold, and put it in the fridge for about 20 minutes. I did this for blue, brown, yellow, green, and red. After those solidified, I cut them into small pieces. Mixing and matching the colored pieces, I dropped a few into another mold. Pouring the clear soap (after repeating above steps for melting) into the mold with the cut pieces of colored soap, I added droplets of essential oil. Let it harden and you're left with a clear soap spotted with color. It looks like a natural rock before it's been shaped. It's a pretty easy gift to throw together and fun to work on. If I do opt to make crafts for gifts next year, I'll probably work on it in advance and leave out the last-minute hustle. I have a confession to make. 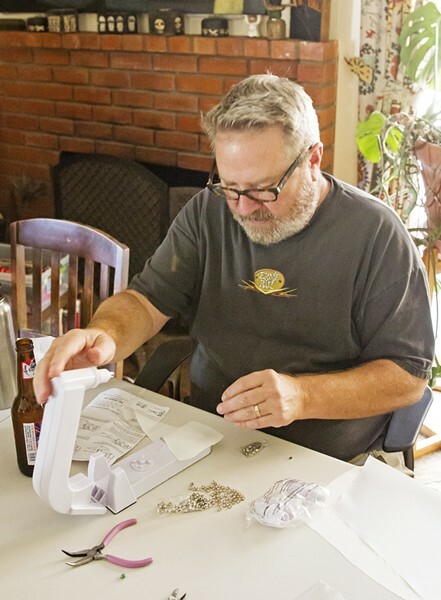 I love making jewelry—not that I'm good at it, it just sort of Zens me out, plus I have something to show for all that relaxation at the end of it. If you don't know the basics of jewelry making, don't worry, because the basics are simple and if you swing by Beads of Sharon (which shares a storefront with I Love Rocks) in the Marigold Shopping Center, Sharon is happy to drop some knowledge on you. She teaches classes at the shop, and recently, she gave me a two-minute lesson on how to give metal that hammered look. To bead right, you need to spend some time picking out your beads and associated links (which you can attach beads to). Give yourself at least half an hour for that part of things. You can't rush creativity. For this project, I grabbed some turquoise-colored glass beads with an oblong link to attach them to. I searched for an online tutorial because I wanted to wrap the wire around each eyehook, so it would look more "professional." Turns out, that wasn't as easy as it sounded—and don't they always make it sound easy. My gigantic hands had a hard time doing the tiny work of using pliers to loop wire around wire! Yeah, there was some swearing in between attempts, for sure. Not exactly the relaxation I'd anticipated. But I figured it out eventually. Attaching one bead with said (imperfect) looping to the bottom of the link and one to the top and to the ear wire, a glass bead dangles from both the bottom and the top. It took me less than an hour, it cost me about $4, and it's wearable art (well, wearable love). Who doesn't want that? JUST GLUE IT Turns out it's easy to fail at Pinterest, but sometimes you can win, too. Or you can do both by crafting snowflakes out of hot glue, Modge Podge, and glitter. I'm a chronic crafter, and the holidays are always an opportunity to bog myself down with endless DIY projects. Whether it's the bright idea to craft my own Christmas cards, make Mason jar winter scene dioramas, or endlessly wrap yarn around a fork to make pom-poms, I've done it all. Generally I'm pretty good at recreating Pinterest magic, but that doesn't mean an epic "Pinterest Fail" doesn't creep in there. I'll never forget you, glitter explosion 2010! 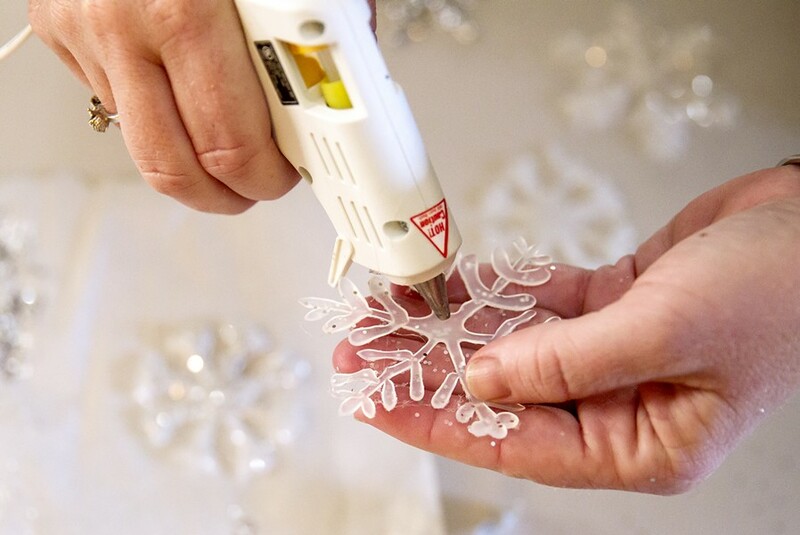 So when the seemingly easy project of hot glue snowflake window clings popped up, I thought I had myself an easy-peasy crafting afternoon ahead of me. But getting them to look like snowflakes and not blobs of snowman snot is not so simple. You'll need a hot glue gun, glue, snowflake templates, parchment paper, Mod Podge sealer, and the gift that keeps on giving despite numerous showers—glitter. I printed out free snowflake templates, one large and several small ones. I have a large and a mini glue gun at home already, but if you don't, they can be had for a few dollars, depending on brand and quality. You are going to go through some glue making these, so stock up! I also grabbed some glitter. I went for the middle-of-the road stuff, which set me back about $10 total. Mod Podge is glorified glue, but it works well and runs around $8 and will last forever. All of this came from Beverly's in SLO. You need a steady hand, which I don't have, and patience, which luckily I had in spades that day. After some practice and frustration, I got a few flakes I deemed good enough to dab with hot glue and stick to a mirror, as well as a pile of "special" snowflakes that went straight into the trash. I then brushed Mod Podge on top of the keepers and sprinkled them with glitter. As far as cheap and simple goes, this one is a win. If you don't want a flurry of snowflakes on your window and some pretty significant finger burns, peruse Pinterest for other ideas. I had a lot of fun making my Mason jar winter scenes and continue to put them up at Christmastime. Give it a try! "Don't be dull, be dazzling! Dazzle with the Bedazzler, the kit that can change your wardrobe from dull to daring!" I first saw commercials for the Bedazzler in the late 1970s when you could buy the mail-order gadget and have it shipped directly to your home. Then you could use the glorified stapler to fasten studs or rhinestones onto denim jackets or jeans, taking ordinary clothing and making it look ridiculous. CONFUSION STATION Glen Starkey tries to figure out his Bedazzler. Thanks to the Bedazzler, soccer moms nationwide could create shiny kittens on their sweatshirts. Disco queens could rhinestone the crap out of shirt collars. Little girls could make their doll clothes look like Liberace threw up all over them. Naturally, I had to try one, and speaking of Liberace, I thought I could Bedazzle an off-white satin cape for my wife's 11-month-old, one-eyed, one-testicled pug Boscoe. Since I don't sew, all I needed my wife, Anna, to do was make a pattern and sew the cape, which after Bedazzling for about two hours, I figured was the easy part. Bedazzling is hard! First of all, don't read the confusing directions, which come in three languages, none of which make a lick of sense. Next, plan your pattern carefully, and then plan for it to look terrible as the fabric stretches and shifts. After Bedazzling for a while, plan for the heel of your hand to become abraded, then try to figure out a new technique. I began using my elbow like I was doing an elbow-drop wrestling move. The $20 Bedazzler I bought at Michaels came with 150 silver studs, 50 clear rhinestones, and 50 colored rhinestones, and I ran out of blue rhinestones after I used 14. Granted, I may have lost some. They're made to be handled by dainty kid fingers, and my less-than-nimble mitts had a hard time working with them. I also planned a much more elaborate design, but eventually I gave up and used one of my wife's fabric markers to finish my decoration. I bet some little fashionista in the making would have fun with this thing. If $20 is too cheapskatey, I also considered the Didiloom that let you weave words and symbols into bracelets for $50. I am not a crafty person. If it can't be put in a Mason jar, then I don't make it. But I come from a line of women who could sew their asses off. My mother made my Halloween costume every year, pieces with stunning detail that ranged from Queen Amidala to Sailor Moon to Baby Spice to several iterations of different fairies. I can sew a button on my shirt when it falls off. So of course, each year when I ask my mom what she would like for Christmas she says, "Oh, why don't you just make me something." How the woman who birthed and raised me can't grasp that anything I would make her might be as impressive as my clay preschool handprint is beyond me, bur here we are. A LONG YARN A YouTube video can walk you through the technique it takes to turn knots into a wall-hanging. Naturally when the editorial overlords at New Times forced us together for an afternoon of DIY time and drinking, I knew who I would be crafting for. (DON'T READ THIS MOM!) 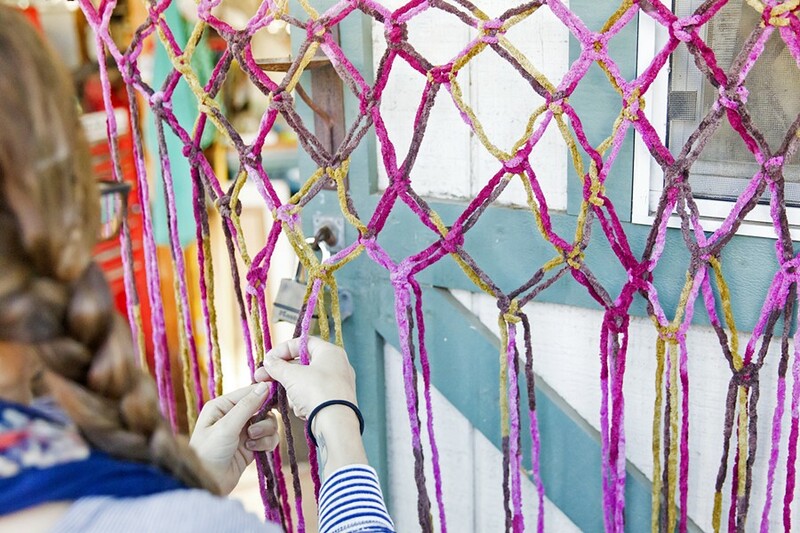 I settled on a macramé wall art hanging because I've secretly always wanted one, and they can be quite pricy on Etsy. I imagined things would end with a hopeless mess of knots covered in my tears. I found a tutorial online from the in-the-know ladies at classyclutter.net. They thankfully provided a YouTube video that detailed how to make the three types of knots the craft would use: the lark's head knot, the square knot, and the double half hitch knot. The first knot, the lark's head, inordinately boosted my self-esteem, since this simple knot essentially just attaches your materials to the wooden dowel. Things got dicey for a bit when I progressed to the square knot, which makes up the bulk of the design and requires you to frequently switch directions and count. (Pro tip: Having your project hanging up as you make it will allow you to actually see what the heck is going on.) But the double half hitch knot to make up the border of my design emotionally and mentally DESTROYED me, guys. Several rounds later of pressing replay on YouTube, seeking advice from my fellow crafters, and drinking some whiskey (chased with beer, a la Starkey), I had a wall hanging that actually kind of resembled the tutorial's photo. Sure, it's not perfect, but as I look at my macramé wall art from where it hangs in a not so hidden spot, I kind of want to hang on to it. And isn't that what Christmas is really about? Gifting others with really cool loot we'd rather hoard for ourselves. Why buy a teddy bear when you can make one yourself? Well, if you're like me, the final product might look more like a Frankenstein monster than Winnie the Pooh. I'd never sewn anything in my life, so "My First Sewing Kit," which I purchased at Michaels, sounded like the perfect way to start. STUFFING ANIMALS With the My First Sewing Kit, all you have to do is pull out a little stuffing, grab a cat cutout, and put the thread through the needle. There were many reasons for me to assume this kit would ensure a successful sewing experience. 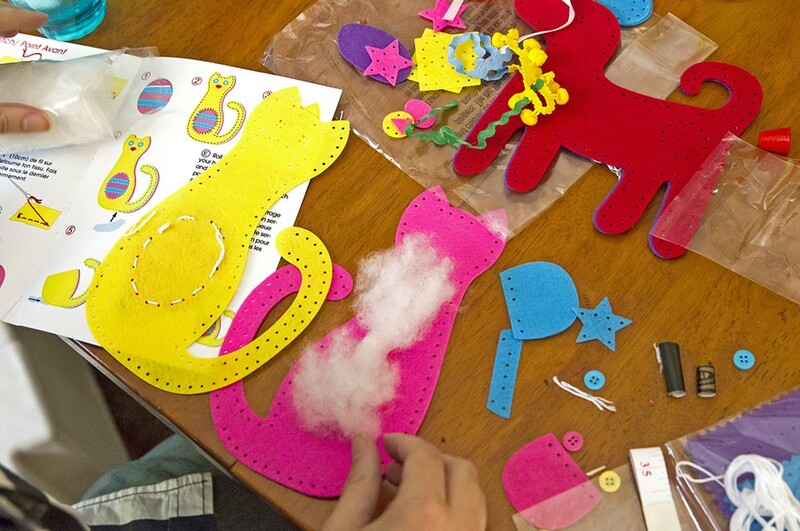 The kit is targeted toward young children, so the needles are plastic and the holes are already cut into the predesigned felt shapes. It was really nice knowing there wasn't a risk of cutting or poking myself. The first challenge was getting the string through the needle. I don't know if my fingers were too big (since it's meant for kids) or if I just have really bad eye-hand coordination, but I found it nearly impossible to get the whole string through. I finally did though, after many failed attempts. The kit comes with three stuffed animal designs to choose from—a cat, a dog, and an elephant. I chose the cat. It looked like the easiest one. I really don't know what went wrong. Maybe I used too much stuffing? Maybe I skipped a single, crucial stitch? Whatever the cause, the stitches couldn't keep the stuffing from peeking out of various corners. The cat looked as if it was leaking cotton all around it. Other than that, the final result wasn't horrible, but it was far too messy to give away as a Christmas gift—whether it be for one of my young cousins or my dog (it'd tear apart far too easily for him to ever play with). But I felt kind of liberated at that point. I had decided this misshapen creature was for me and me alone—a Christmas gift to and from myself. Moving forward, I stuffed the dog and the elephant as well. Both animals came out just as messy and fragile as the cat. Is there a way I can make it look like I did all of this on purpose? I asked myself. Eureka! An epiphany hit me sharper than a plastic needle. With newfound inspiration from The Human Centipede, I stitched the end of the elephant's trunk to the end of the cat's tail. I then stitched the dog's nose to the foot of the elephant's fourth leg. What started as a Christmas project turned into something I'll save for next Halloween. I wanted to take the opportunity with this do-it-yourself version of our Last-Minute Gift Guide to build something with wood. HANDMADE All it takes is some thought, a Google search, and wood to manhandle a planter box together. I'm not the handiest of men (unless manhandling a keyboard counts), but find I do feel great when I manage to successfully build anything. For instance, a few years ago in college, my friends and I built a huge coffee table from scratch that's still in use today—and that was super fun and satisfying. So I scaled that concept down for this story and decided to make a small planter box for an herb garden as a gift to my sister and her boyfriend for Christmas. In preparation, I nearly decided to just buy a pile of wood and figure out the rest out later. I'm glad I didn't. Instead, I Googled around and found simple instructions for a small, bare-essentials planter box. Then I drove to Home Depot and measured out some cedar wood. I came home with five pieces and a bottle of wood glue. The key for the wood sizing is to make the two side pieces a little longer than the bottom one to leave room on each end to slide in the square end pieces. All I really had to do was glue the pieces together and use clamps to hold them until they dried. At first, I tried to push them together with my hands, which almost led to disaster as the pieces slipped and slid out of place. Somehow, I managed to line them up just right before the glue dried. Once the box was done, I asked Glen if he had any paint to spare for decoration. He handed me bright, fire engine red spray paint. It turns out that red is a pretty, um, loud color for a quaint herb garden, so in retrospect, it would've been smarter to think about the best color beforehand and buy it on my own. At home, I finished the box by putting in some screws to hold it together and drilled holes in the bottom for drainage. I'll probably also paint the inside with some acrylic paints for a little protection against moisture. Brian Talley may represent four generations of farmer stock, but he still learned how to cook like the rest of us. In other words, he cooked what he liked to eat, and as a kid, it was all about the sugar high. FARM FRESH FAMILIAL FEASTS Put down the cell phone (we mean it) and actually enjoy dinner with your family this holiday season and most days thereafter. Talley Farms' Brian Talley has made this task easier thanks to his book Our California Table: Celebrating the Seasons with Talley Farms. "The first recipe I can remember making on my own was French breakfast puffs—small muffins with just a hint of nutmeg, dipped in melted butter, then coated on top with a mix of sugar and cinnamon," Talley writes in the introduction of his new family cookbook. "In fact, this is one of the first recipes that my daughter learned." With a Central Coast legacy spanning four generations, the Talley name conjures up rolling farmland and vineyards, where incredible pinot noir and chardonnay ripen near the coast. You may think of Talley's Arroyo Grande property, tasting room or CSA boxes stuffed with corn, peas, or green beans. But do you think of spicy cioppino and flame-grilled Santa Maria style barbecue? Do you think of savory rosemary cheesecake or quail glazed in rich local honey? Talley's tome, Our California Table: Celebrating the Seasons with the Talley Family, is an all-access pass to the clan's favorite meals through the years. No longer crumpled in a drawer stained by oil, wine, and time, these farmer-approved recipes are displayed alongside vivid full-page photographs that put each humble ingredient—portobellos, Brussels sprouts, even spaghetti squash—into sharp focus. Divided by season and peppered with wine knowledge, farm lore, and familial tidbits, the book is warm, and feels a lot like the holidays. Needless to say, the hardcover makes a grand present for the farm-to-table chef in your clan (these days, each family has at least five, right?). "The main tradition I really enjoy is just the act of cooking together, which is something I grew up with and continue," Talley said. "I hope this book brings people together to prepare and share a meal." Cooking and sharing a meal can be harder than it sounds, especially when schedules collide and unexpected guests come calling. But these aren't all complicated dishes. You really can't go wrong with Grandma Hazel's apple pie, which calls for quality ingredients lovingly handled. "If you look at the pie recipe in the book, you'll see her notebook, which we photographed the day that my grandma taught me how to make that pie," Talley said. "That recipe has a lot of meaning in my life." The Talley family's tradition of cooking and devouring Dungeness crab each Christmas Eve is perhaps just as simple—and totally decadent and delicious. "Cook and clean the crab, and then it's just the matter of making the very simple pink sauce in the recipe," Talley said. That sauce, in case you're wondering, is all of three ingredients: lemon, heavy cream, and Heinz chili sauce. Pair this seafood dish with a crisp chardonnay or a dry riesling. There are plenty of other savory winter dishes to learn and love (hello braised short ribs with steamed buns), but spring offers plenty to look forward to as well. Talley called out a personal favorite: chiles rellenos with squash blossoms and corn. "That one was inspired by a trip I took to Mexico in the spring of 2016. Mine is a healthier, modern interpretation of what I experienced," he said. You could pair it with the farmer's "three generations of salsas," conveniently located on page 184. I mean, why wouldn't you, if you happen to have the peppers on hand? "The book really celebrates the local ingredients we have here, all the accompaniments are vegetables we grow on our farm," Talley said. "With a few exceptions, the recipes tend to be healthy, so you can eat them year round." In honor of the farm and all those who care for it, profits from the sale of the book will be donated to the Fund for Vineyard and Farm Workers, an endowment held by the Community Foundation of SLO County for the benefit of farmworkers and their families. If that doesn't give you a warm and fuzzy feeling, nothing will. So raise a fork and perhaps a glass. Any old glass. 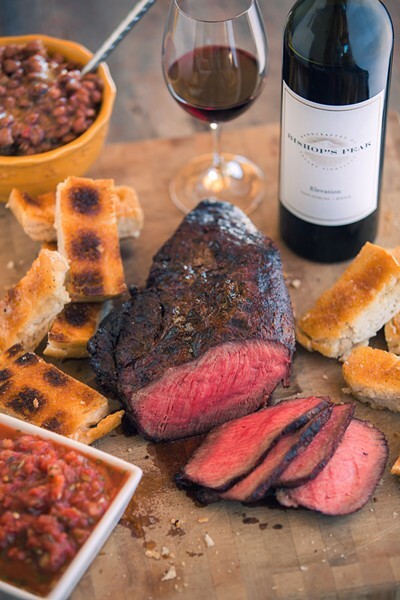 Because when it comes to food and wine pairing, Talley is a realist. "My philosophy is simple: Good food, good wine, and good people equal a good wine pairing." Crochet that into a holiday pillow!